Are you tired of waiting for the daily updates of True Blood or Game of Thrones, Walking Dead? Do you want to go over you favorite TV series years ago which cannot be find on TV streaming sites? You got the right place here! Just purchasing the DVD and rip the episodes from DVD. If you have ever tried to rip TV series DVD to individual episodes, you know how hard it is to split DVD into episodes since most of commercial DVDs have copy protection. Whereas free DVD ripping tools, such as Handbrake, do not have the native ability to Unlock protection copy protections of TV episode DVDs. So facing at the impossibility of ripping episodes from DVD with Handbrake, a more powerful DVD decrypter (namely Handbrake DVD Decrypter alternatives) is in demand. Best DVD Ripping Tools to Rip Episodes from TV Series DVD to MP4, AVI, MKV etc. MacX DVD Ripper Pro is a convenient and powerful DVD ripping program, which can rip TV series from DVD to MP4, MOV, AVI and other formats or backup TV episodes DVD to hard drive with high quality reserved. Compared with other DVD ripping software, MacX DVD Ripper Pro comes with its strong ability of both bypassing all DVD protections including DVD CSS, region code, RCE, Sony ArccOS, UOPs, Disney X-project protection, etc. and specifying the correct title automatically. 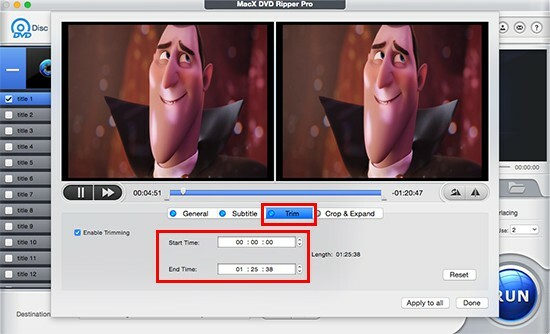 What's special to users is that this Mac DVD ripper thoughtfully gives you flexible DVD adjustment feature. When you just need to rip episodes from DVD with one or several titles, it enables you to manually choose any title you want. The trim feature lets you free set the start time and end time of each episode from TV series DVD. How to Rip TV Show/TV Series DVD Into Individual Episodes? Step 1: Load TV Episodes DVD. At the very beginning, free download this TV Episodes DVD ripper, install and launch it. By the way, Windows users are suggested to get the Windows version (Windows 10 included). Then insert your TV episode DVD or TV show DVD into the drive and click "DVD" icon to import the DVD. Note: This DVD ripper will automatically choose the DVD title with longest duration. If you need to rip other episodes from TV show/series DVD, please manually select them. Choose the desired output video from the pop up interface. Here selects "to MP4" as the output format for its good compatibility. Step 4: Start to Rip DVD to Individual Episodes. Hit the "RUN" button to start splitting DVD into episodes on Mac with the talented DVD ripping software. You can view the whole progress and are able to cancel it at anytime. 2. Rip title 2 → The actual result you get is: title 2+ title 3. Go to DVD editing section → Tick "Enable Trimming" → set the Start Time as 00:00:00 and End Time with right title length. Usually a TV series episode title is around 20-60 mins. Make your own judgment based on the specific matter. Notice: We only advocate using this top Mac OS X DVD ripper to rip episodes from DVDs for legal personal use, instead of illegal reproduction or distribution of copyrighted content. Please obey your local DVD copyright law before doing it. DO NOT do harm to others' lawful rights and interests. Any Other DVD Ripping Software for Ripping Episodes from DVD? Actually, different strokes for different folks. There are more than one choice for ripping episodes from DVD to MP4, MOV, AVI, MKV etc. Some other DVD ripping softwares are also widely used. Now let's check the highly acclaimed tools for extracting episodes from DVD. 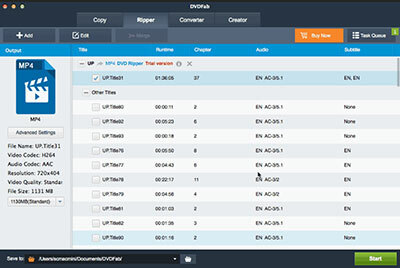 DVDFab DVD Ripper is one of the popular choices for ripping TV series from DVD to MP4, MKV, AVI etc. It can convert DVD and rip Redbox rental DVD to popular file formats for many devices. And thanks to the newest NVIDIA CUDA, Intel Quick Sync, multi-core CPUs, this program enables batch conversion with slapping fast speed. Many Blu-ray DVD users would like to fall back on MakeMKV when they are willing to split dvd into episodes since it reads DVD and Blu-ray discs smoothly. MakeMKV is a format converter, otherwise called "transcoder". It converts the video clips from proprietary (and usually encrypted) disc into a set of MKV files, preserving most information but not changing it in any way. Here's the most simple way recommended for you to combine DVD episodes into a file for your convenient storage and playback. 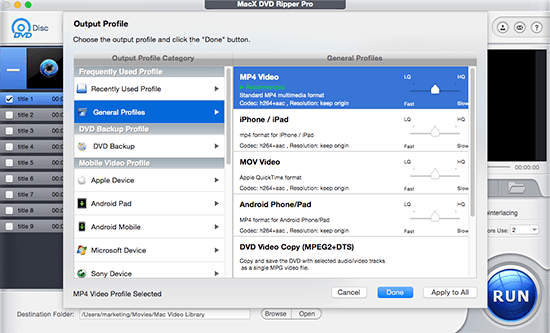 MacX DVD Ripper Pro is one of the best tools that you can find to rip episodes from TV series DVD or TV shows DVD to your Mac with MP4 MOV MKV AVI iPhone iPad Android, etc. It's a handy thing to have when you're trying to back up your DVD collection.